Spring usually is not the time to contemplate how to store frames of foundation, but I was asked about this recently. In addition, I was just hanging up some drawn, empty frames that once contained honey, which my bees have eaten. the line on the right is 40 feet long. I favor the “under cover in the open air approach”. My drawn frames of foundation are hung on long flat pieces of thin wood that are suspended from the rafters of my 40-foot barn’s hayloft. My not terribly high tech approach was to hammer nails into the rafters, then suspend bailing twine down to the wooden holders. These hang from September to at least April. This means long periods of rain, snow, and sub-freezing weather. But the frames are always under cover. I have never had wax moths using this method. Bailing twine was the suspension method chosen because I have goats, which eat copious amounts of hay. Thus I have copious amounts of bailing twine. The long pieces of wood are by-products of my husband’s furniture making. Time is always of the essence. If I run out of space on the overhead hangers, and have no time to create more, I go for the “three deep tunnel of frames” method. Boxes of drawn comb are stacked on end three deep. Another three can go on top, and on up the roof. The idea is never to go deeper than three in a stack. Normally, the sides of these boxes sit against a stack of empty boxes or the wall of the barn for stability. Always the solid side of the box, the open sides are left open. I learned this in an old issue of Bee Culture. That beekeeper suggested putting 1/8th inch hardware cloth on each end of the little “tunnel”. I believe this was mainly to keep mice out of the boxes. I have cats. I don’t have mice. Cats are easier than building frames, in my humble opinion. Like the above method, this allows for light and air to reach the frames. Both methods depend upon air and light. Wax moths, it would seem, greatly prefer to lay their eggs in dark, safe places. In the over ten years of using the hanging method, and two years of additional little tunnels, I have never had wax moths in my stored frames. Although late fall is the usual time for me to be hanging frames; as I said, I just got done hanging up frames pulled from empty boxes. It’s the time of year here to assess the hives coming out of winter and prepare them for spring. That always leaves me with a few empty boxes that need to be stored before they go on again in the spring. That’s the news from Brookfield Farm Bees and Honey, Maple Falls, Washington – I hope your spring bee chores are bring you good news from your hives. Do you store boxes without moth crystals? If so, what method are you using? I’m always up for new ideas. 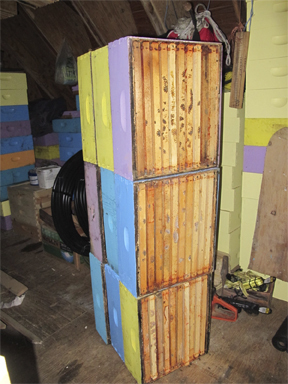 This entry was posted in Beekeeping, Hive Components and tagged bee, Brookfield Farm, drawn, foundation, hive, Maple Falls, storage, Washington. Bookmark the permalink.